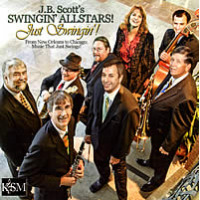 Classic jazz from New Orleans is essential to performances by singer Lisa Kelly and trumpeter JB Scott but the couple showed once again what a wide net they cast when digging into material from the jazz canon, Great American Songbook and vintage popular standards. In the Charlotte County Jazz Society's 2081-19 season opener on Monday, October 8, their sextet mixed in a lot of fresh material with six of their concert staples, five of them rooted in New Orleans. This was the band's third visit to Port Charlotte in five years. 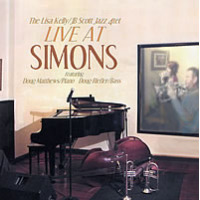 Kelly and Scott's band for this concert included pianist Jeff Phillips, bassist Jay Mueller, drummer Clyde Connor and trombonist Dave Steinmeyer. This was the first time they'd been able to bring fellow Jacksonville resident Steinmeyer to Port Charlotte. His credentials are mighty. He spent 28 years with the U.S. Air Force big band, The Airmen of Note, and led that outfit for more than a decade. 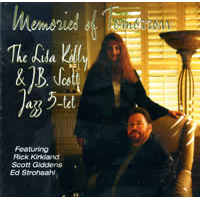 Scott is coordinator of jazz studies at the University of North Florida in Jacksonville. He has strong New Orleans jazz credentials, having led the Dukes of Dixieland for three years. During that time in the Crescent City, he was mentored by trumpeter Al Hirt. This outfit swings the heck out of its music, always finding new things to explore in material performed in prior engagements- and make the evening fun at the same time. The night's New Orleans material included Basin Street Blues," Sweethearts on Parade," When It's Sleepy Time Down South," Do You Know What It Means to Miss New Orleans?" and the concert closer, When the Saints Go Marching In." Kelly's feature on How High the Moon." This sultry version was performed at a slowed half-time rhythm and featured Steinmeyer on trombone. 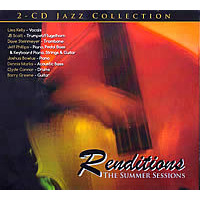 On The Days of Wine and Roses," Kelly supplemented the lyrics with some trombone-like scatting to create a call-and-response moment with Steinmeyer. Scott did something similar when he used some drum-style scatting to mix it up with Connor on Sweethearts on Parade." The sextet's take on Dizzy Gillespie's classic A Night in Tunisia" dug deep into the tune's Afro-Caribbean underpinnings. Phillips provided that Latin fire with some solid montuno at the piano, complementing Connor's supercharged rhythm. Kelly's other fine vocal features included The Very Thought of You," Exactly Like You," The Way You Look Tonight" and That Old Black Magic." She has an uncanny way of turning a familiar tune into something fresh and personal. Scott shifted between trumpet and flugelhorn as the material required, and added vocals on several New Orleans staples plus Lady Be Good." He also featured the band on a fine original- the gospel-tinged Inspiration." Steinmeyer was a great fit in this group. His trombone artistry was filled with fluidity and clever counterpoint to Kelly's vocals and Scott's horn solos. The concert drew an early season crowd of about 200 to the Cultural Center of Charlotte County's William H. Wakeman III Theater. This story appears courtesy of Ken Franckling's Jazz Notes.